"Enemies from the Past" takes over the MBC Mon-Fri 19:15 time slot previously occupied by "Return of Bok Dan-Ji" and followed by "Secrets and Lies" on June 25, 2018. Shawn Dec 10 2018 2:47 am Came back just to post that this was the best drama I watched in 2018!! I still miss it and the characters and the actors!! Tara Jun 02 2018 5:30 am Good drama. Love all the casts esp the OTP they really look good together. Recommended daily kdrama. Anne Jun 01 2018 5:39 pm Best daily drama I've ever watch. Im wishing for the leading actor/actress will become real couple in real life, coz they look so great together. I fell in love with them.. good job, well done to all. ? ? ? ? ? ? ? ? Jain WritersGuildOfAmerica May 31 2018 4:59 pm Enjoyed Choi YoonYoung in lead role (irritating but grew more likeable in My Daughter, Seoyeong); first time seeing Go Won in any drama--very likeable (needs to buff up just a bit--he's rail thin, but very warm, likeable). I usually only watch 16 episodes or max 50...the 120's are too time consuming. This one moved much more deliberately and with fluidity (FINALLY!) after the last 4 or 5 episodes...prior one character would tell an event, another character would tell and event within the same short 33min episode =bad use of air time. So now that it's wrapping up..this would have been a good 50 episode drama. The use of powerful middle-aged TALENTED actresses is excellent in their high drama interactions. Good training interaction for the younger actresses. Takes more than "crying on cue" to present a 3-dimensional character in acting. Good job, Thespians!! Tanya May 31 2018 9:45 am This is amazing! I screamed in happiness when they all joined force and tricked that crazy Oh Na-Ra.. plus she got a slap from Go-Ya's mom! Serves her right. She deserves more than a slap. She is so exposed now. HAHA! I hate her! She's so full of herself! She's acting like an annoying baby brat! I can't wait for her to go to mental or jail. Shawn May 17 2018 12:01 am This was extended to 123 episodes! YES! Still loving this drama!! I want more!! pjewel May 14 2018 8:53 pm Don't waste time watch another not only boring but nonsense drama. Story line is always out....poor script writing again..aikz. Denada May 04 2018 9:26 pm This is the best daily drama ever! Usually daily drama is good at first and starts to get boring in the middle towards the end. But this one is not! Amazing! Looking forward to each episodes everyday.. And i love how people talk and analyze about this drama at some websites... It realy brings out so many interest in people... kuddos for the writers!!! annie Apr 24 2018 5:48 am hi, anyone know the name of the song on episode 89 towards the end? Goya Apr 06 2018 10:07 am @Emi, korean women don’t change their surename after married..
Emi Apr 04 2018 10:25 am I love this so much! They finally got married. Ji-Seok is such a sweet perfect husband. But why Go-Ya is still Choi? She should be a Min now. I can't wait to know about Go-Ya's real mom or real family. And for sure Ji-Seok's grandma knows about Go-Ya's mom or maybe Go-Ya's grandma. I remember her thinking before that she sees someone in Go-Ya...like she resembled of someone that she used to know... For sure Go-Ya got her cooking skills from her mom's. The real one. And she must be rich. Omg. I hope she's rich! That's gonna be awesome! I can't wait to see the devil Oh Na-Ra's downfall. Bwahaha! tara Mar 15 2018 7:17 am OMG today eps (69) was totally heartbreaking. Poor GY. But Salute for her acting skill. Can't wait for next eps, seems more interesting.Hope JS give his aunt a nice payback. Shawn Feb 27 2018 12:30 am This drama is sooo good!! Ji Seok & Go Ya's chemistry is off the charts amazing!! Ep 56 was full of sweetness and that ending almost made me cry it was so beautiful! The way Ji Seok sang his heart and soul to her the way she watched him with love shimmering in her eyes nearly took my breath away!! They are such a beautiful couple!! San Duel definitely has a thing for Go Ya! He must know she's not truly related to him, but how does he know is the question! Is it his psychic like abilities or did he overhear it from someone else like his mom/aunt?? I really love Eun Seok and Go Bong also!! Maybe he will help her mature/grow up and she will help him loosen up!! I can't wait to see where they take these two!! Ji Seok's mom scares me! LOL! I can't wait until she finds out Go Ya will be her future daughter-in-law!! I hated her in Blow Breeze, but love her in this drama! The actress is amazing!! Ji Seok's grandmother is such a great character! I love how she silently roots for Ji Seok and Go Ya!! I can't wait to see more scenes of her and Go Ya and when Ji Seok can shares scenes with them as well!! I have missed this drama! Thanks to Bravo My Life for helping the agony of waiting for its return! I binge watched all 56 episodes of it in less than 2 weeks!! It was amazing, too!! Sooo glad Enemies is back!! YAY!! tara Feb 09 2018 1:38 pm @Dalin no this time we must wait any longer, coz drama will be aired again in 26 Feb 2018 due Olympic games broadcast. So we must be super patient. We're gonna missed our OTP a lot ?? Dalin Feb 09 2018 8:37 am I hate fridays..have to wait 2 days to watch the drama again..
Mint Feb 02 2018 12:33 pm OMG! Episode 50, Go-Ya and Ji-Seok FIRST KISS! I'm loving them together since episode 1 I got hooked! But since it has a lot of episodes, for sure there are a lot of sufferings for Go-Ya and Ji-Seok's relationship. And San-Deul, the way he acts, it's obvious that he has a thing for Go-Ya. I hope that witch Oh Na-Ra will suffer!!!!! But I'm glad that there's no female antagonist here like love triangle thing. It's a change that the antagonist female is an aunt. So it's cool. Lica Jan 31 2018 3:19 pm I feel bad for Go Ya, but i blame herself because shes too naive and thinks everyone is good. How can she so easily trust her father again, i mean shes happy about the donor but she should be more wary of him. I think she would maybe forgive Oh Sa Ra, again if she acted nice again. Well it is the main leads naive and kind nature that makes this drama bearable. Goddess of love Jan 31 2018 8:06 am I watch this drama only because of Eun-Seok and Go-Bong.They are too funny and had a beautiful meeting.I have followed how Go-Bong make Eun-Seok fall for her.Although he is so legal and she is so illegal,they would be able to remove their deficiencies of each other.In addition,as Hye-Eun told,Go-Bong had an amazing body and she is so beautiful.Eun-Seok is so handsome and has a great voice,As he was in "The Great Wives" and other of his movies. jinjoo Jan 29 2018 11:37 pm i luv GY/JS love team! so sweet & endearing! this drama is so addictive and you just clamor for more each epis/each week! luv luv it! i hate GY's father and that wicked witch NR, the father acts as if it's not his family who he abandoned 10 yrs ago! both of them are heartless and greedy! Indi K Jan 25 2018 8:45 am JS and GY are so sweet....Getting sweeter and sweeter every episode... Makes me smile all the time... I hope it’ll last a long time before the storm came out ? tara Jan 24 2018 9:33 pm I'm more in love with this drama. Esp GY and JS's love story..they are so natural, simple but sweet. Can't wait for next eps. pjewel Jan 23 2018 6:52 pm Another lame script writings & sad to speak the story goes weakly on. Again another drama that you can keep skipping until the end. Will take note of this writer's story once again. Wasting of efforts. Angel Jan 05 2018 12:15 am I think so too.. I think Go Ya is a child from the father previous relationship. That’ why Go Ya’s mom said “blood thicker than water” to Go Ya’s aunt. It means that Go ya is related by blood with her father and aunt, but not to the mother. And this means San Deul could not have a special feeling towards Go Ya. They are related by blood, right? It’s just oppa-dongsaeng relationship. Nothing more.. I caught that as well (about Oh Na-Ra's mom hiding a secret about her birth). I think the easiest go to is that she's a daughter from her father's previous marriage and that her mother is actually her stepmom. Either that or her father had an affair early on in their marriage and Go Ya is his lovechild from that who he somehow got custody of. A fun but out there twist would be if Go Ya is the child of someone else entirely like another family member, maybe the mom's sister or from the father's side of the family and she's basically adopted. It would go a long ways towards explaining why her mom favors her own daughter over her and why she holds so much of her resentment towards her ex over her head. That said I do think her mother loves her but she's grown bitter over the years and that's hard to get over. I doubt hormones would fix everything but they could help and she's definitely a candidate for antidepressants. The best thing for the mom would be to let go of her hate and start living for herself again. It would be nice if she could learn to let go of that anger and do like the doctor said but it may be too late. Really, if there's a common thread among all of the lead female characters, it's their shared bitterness about the past and how it poisons all their current relationships. The grandmother still blames Ji Seok's mother (Oh Sa-Ra) for her son's death and judges her for having depression while Ji Seok was young then fobbing him off on her sister. It's pretty obvious that the only reason she invited Oh Na-Ra to the house was so she could lash out at her while seemingly taking the high road of 'You should be a better person and forgive your sister'. That might seem more genuine if Jang Ok-Ja wasn't treating Oh Sa-Ra the same way. The father, though? After he donates a kidney or whatever he needs to go. That guy is lower than scum. tara Dec 27 2017 2:46 pm I love this drama so far. The leads have amazing chemistry. I love their lovestory, so sweet n nice. Shawn Dec 26 2017 5:23 pm I love this drama! The leads have amazing chemistry and the plot is awesome!! I also love the secondary plots and characters!! Ji Seok and Go Ya are ill-fated, imo, but fated to be ogether at the same time!! I can't wait until secrets are revealed, but love that we are seeing the two of them slowly fall in love while things are lying in wait to implode upon them!! I love seeing Ji Seok's grandmother be a Fairy Godmother to Go Ya!! I hope she plays matchmaker for her and Ji Seok, but looks like things are working out on their own between Go Ya and Ji Seok! I love when romances start out with hatred between the leads and then blossom into a romance!!! I also love Go Ya's materialistic sister, Go Bong! She's so funny! I think Eun Seok will help her mature and she will help him loosen up and get over his first love! They are going to be so perfect for each other in the end, but for now they seem so imperfect for each other that it's hilarious! She's so laid-back, silly, and immature and he's highly intelligent, so uptight, and way too serious! There's a lot to love about this drama!! The rating of 83 is way too low for it!!! Should be closer to 100!! This is my first time watching these leads and I'm already wanting to go back and watch everything that they have done!! Mina Dec 23 2017 2:32 pm I LOVE THIS! The chemistry between Go-Ya and Ji-Seok is so great! It's already great even in the first few episodes. I love how the male lead is so crazy and worked up because of the female lead but the female lead doesn't even care and know about his existence. Lol. It's so funny! I'm really enjoying this! I love how the female lead can make the male lead insane without even doing anything, how she manage to make him fall in love with her without even making an effort. It's so good! And I like how their families are connected to one another. It's quite awesome. It's all in one. Drama, Comedy, and Romance. The romance is about to come and I'm super excited! I'm happy that it's monday to friday cause I wouldn't suffer much in waiting. And I'm so glad that it's has a lot of episodes, I'm going to enjoy this one! Choi Yoon-Young is really great in acting! And she's so cute and really has a natural beauty. I'm not familiar with the male lead but damn, he's quite handsome and also has cuteness. They're perfect together! Keila Dec 22 2017 5:17 pm Reem and zoo99 so far on a scale of 1 to 10 what do you give it. Please I don't want to watch if its bad. Reem Nov 27 2017 6:06 pm @fuller21187 I did watch it and I liked it ? It was totally different. I normally start watching daily dramas (though I drop them half way lool) and I have a feeling this drama will be dropped soon (I personally found the first episode dull). 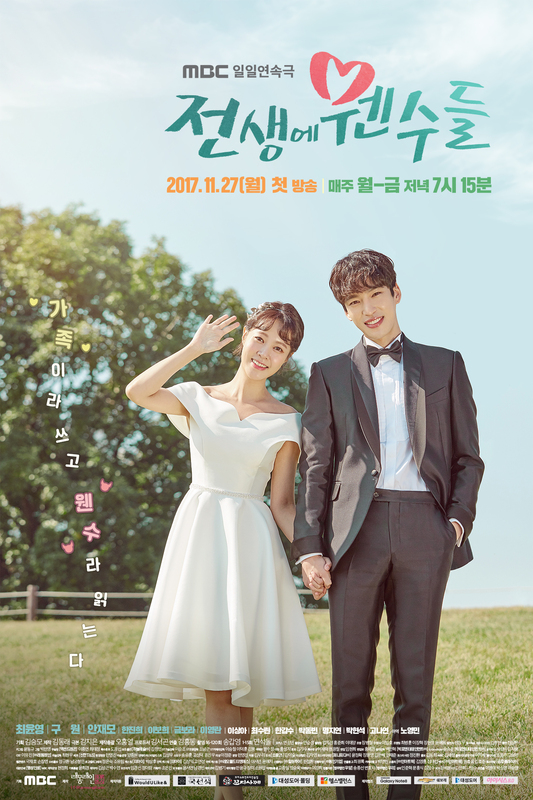 Reem Nov 27 2017 7:33 am I will check out this drama just for Choi Yoon-Young...But to be honest I'm sick of the main female character in most drama is a part-timer, while the main male character is rich!!! They need to bloody come up with better storyline!